Use weekly grocery store flyers to plan your meals for the week. Look for ingredients that already a great deal that have an additional coupon attached. Some websites, like Kraftrecipes.com, allow you to list ingredients and they’ll find recipes that include that item. So if you can get chicken on a great deal, plan several meals around that. They’ll even do a quick search and find the other ingredients at the best deal for you. This will also help you to avoid wasting money by having to throw away old food because you’ll only buy what you need. Price comparisons can take a lot of time, but there are resources that can help. For example, you can use an online plug-in that will work quietly in the background as you do your regular online shopping. Once you reach checkout, it will automatically search through every promo code available through that merchant. Some can even automatically compare prices across websites to make sure that you are getting the best deal possible. 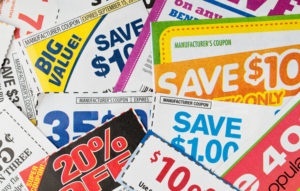 Keep your coupons organized so you can find exactly what you need when you’re ready to go shopping. A great way to do this is with a binder or an index card holder. They can then be filed by product name, item name, or by store. Place the ones that expire first towards the front. The most important thing is that your system makes sense to you. When you take them to the store, keep them clipped together in an envelope in the order that you want to use them. Don’t use couponing as an excuse to buy something you don’t need or even really want. Is this something you would want to buy if you didn’t have a coupon? If the answer is no, save your money instead. Resist the temptation to make spur of the moment purchases. Stick to the list you made and don’t go into stores that you don’t need to visit.